The Zondervan Biblical and Theological Lectures series provides a unique audio learning experience. Unlike a traditional audiobook's direct narration of a book's text, A Theology of Biblical Counseling: Audio Lectures includes high quality live-recordings of college-level lectures that cover the important points from each subject as well as relevant material from other sources. For over four decades, biblical theology has been at the core of the biblical counseling movement. Leaders in biblical counseling have emphasized a commitment to teaching doctrine in their counseling courses out of the conviction that good theology leads to good counseling and bad theology leads to bad counseling. 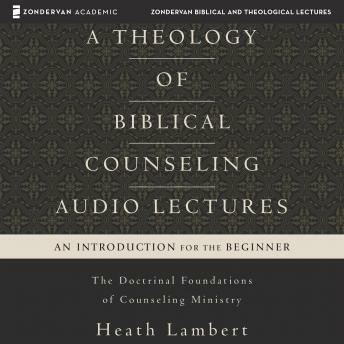 In A Theology of Biblical Counseling: Audio Lectures Heath Lambert unpacks the core convictions that underlie sound counseling and gives practical wisdom for our counseling practices today. These audio lectures show how biblical counseling is rooted in the Scriptures while illustrating the real challenges counselors face today. A Theology of Biblical Counseling: Audio Lectures is accessible for working biblical counselors and for counselors-in-training at colleges and seminaries. In each lesson, doctrine comes to life in real ministry to real people, dramatically demonstrating how theology intersects with the lives of actual counselees.